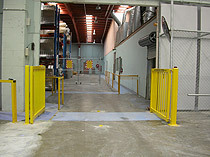 Industrial Safety Gates, a safety innovation for the complete management of pedestrian & forklift traffic within an industrial environment. 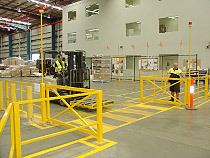 The goal is to completely segregate forklifts and protect pedestrians to ensure safe operation. 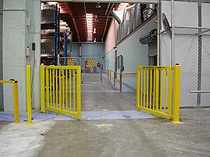 It incorporates walkways with motorised gates that open for pedestrian traffic then close off forklift traffic with the same operation. 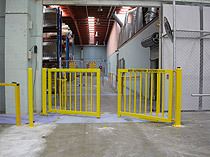 Strobe flashing lights highlight the emanate opening & closing of the gates. The result is very practical traffic flow system that dramatically improves the safety of pedestrian traffic. Gate widths to suit location. – 24 volt Linear, Articulated Arm & Inground operators. 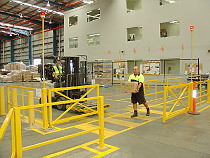 – 240 volt Linear, Articulated Arm & Inground operators. 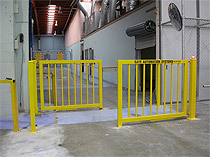 Gate Automation Systems takes pride in training its staff to assist you in the decision making and advising of the correct safety gate requirements & design parameters for your site along with the safety devices required for your specific application, along with the professional installation of the systems purchased.